We’ve got a double-feature in this post. First, we bring you the premiere of a full-album stream for the second album by Costa Rica’s Corpse Garden — Entheogen — which is due for release on May 15 by Satanath Records and RTM Productions. And second, we have an interview with the band’s vocalist Felipe Tencio, who provides insights into the subject matter of the songs and the changes in the band’s sound since their debut full-length in 2012. For those of you who are familiar with that debut album, Burnt By the Light, you’re in for some surprises. Entheogen (named for a chemical substance used in certain religious, shamanic, and spiritual practices) is a savage death metal assault, loaded with dark, vicious riffs, jolting grooves, exotic melodies, electrifying solo work, and horrific roars and shrieks. Though the tempo of the 13 songs on the album varies from fleet, furious rampages to grim, mid-paced barrages, to shimmering psychoactive dreams, the overall atmosphere of the album is ominous and occult, and the production of the music gives it the sensation of overwhelming power. Each song has its own character, each one with its own memorable melodic and instrumental elements incorporated within a framework that blends death metal and black metal to varying degrees. When the band are engaged in full-speed attacks, the technical flair of the super-heated fretwork and blistering drumwork is truly impressive. But even when the band ease up on the throttle, they still exert a firm grip on your throat. And the music is given further dynamism through the use of keyboards as well as unusual musical instruments such as the mellotron and ebow. It’s an obviously ambitious work — and a highly successful one, both atmospheric and electrifying. Entheogen was recorded with producer Juan Pablo Calvo at Bushido Audio Production Studio and was mastered by Eri Román at SoloHit Studios in San José. The cover art — which is a real eye-catcher — was created by Alexander L.Brown [BNB Illustration and Design]. Stream the album below, and then check out the detailed interview with Felipe Tencio. 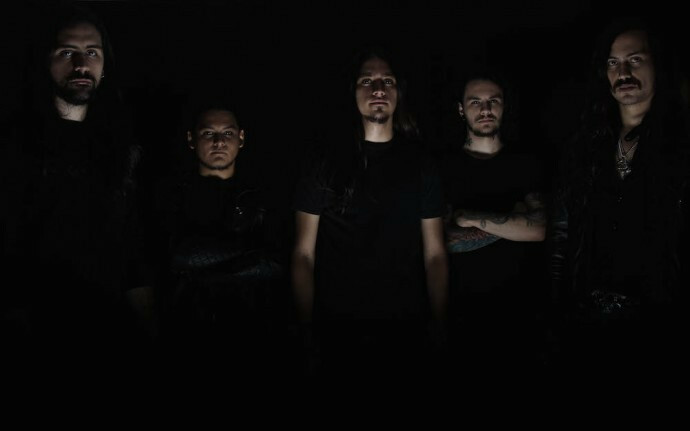 An Interview with – Felipe Tencio, Corpse Garden Vocalist. We had a chat with vocalist Felipe Tencio of Corpse Garden to get some further details about Entheogen. As previously mentioned by the band, the name ‘Entheogen’ refers to a substance taken during spiritual rituals with the aim if transcending to some sort of higher experience. The record also addresses psychologist Carl Jung’s theories of Individuation and the stages performed in the Alchemy’s Magna Opus.What made you want to explore these subjects in Entheogen? Is it something that you have an interest in as a band and have studied? I think each one of us had some previous approach or interest on the subject way before the idea for the album was conceived. At the time I was asked to join the band back in 2013, I was digging a lot into Hermeticism, occultism, and esotericism, so I was quite curious when Federico came to me and explained what they had in mind in terms of sound and concept. I was immediately willing to be a part of the project; we all shared the same vision. A lot of personal events, changes, and new directions in our lives led to a deep interest in the Solve et Coagula process. Erick [Drums] designed the whole combination of Individuation with the Seven Operations concept and then I wrote the lyrics according to it. It was complete synergy. 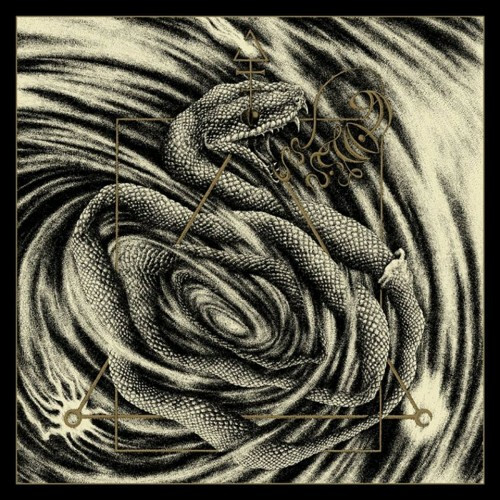 The sound on Entheogen could be described as quite different from what is on 2012’s Burnt By The Light; can you describe the change of feeling and sound on this album? Burnt By The Light was more in the vein of melodic death metal perhaps. For this album we added a lot of new influences to the mix. There’s clearly the traditional death metal base with black, doom, and progressive elements. On top of that, we wanted to explore new sounds, effects, and musical instruments to add some experimentation to the music. There are psychedelic passages on some of the songs, and some other moments can be perceived as melancholic or nostalgic. The general idea was to push the limits of our creativity and craft a new sound and identity for the band. You had a comprehensive line-up change back in 2013. Is this a more solid line-up for the band? How did this change things creatively? Federico [Guitars] and Erick are the sole remaining members of the Burnt By The Light era, then came Esteban on guitars and later Carlos [Bass] and I joined. We managed to establish a very solid line-up, and we all communicate very effectively while writing and performing. The band’s transformation both musically and lyrically is mainly due to these line-up changes. We all share a clear vision of what we want and expect from Corpse Garden and what we are capable of doing with it. One of the hardest parts of consolidating a band is to find the right people with the same way of thinking, four or five different minds working toward a similar idea or objective. I think we managed to achieve that perfectly, some people never get the chance to do so. Does the whole band contribute to the writing process or is it only certain members? We all contributed to the writing process of the album on some level. When I joined, the band had probably 80% of the music for Entheogen written. However, we continued to make changes and to incorporate new ideas and elements even during the recording sessions. This album is the combined work and effort of all band members equally. During the writing process of Entheogen were you listening to any bands/albums in particular? Of course, a lot of what we were listening at the time (and still do to this day) became very relevant to the final outcome of the album. For example, the French black metal scene was very influential for us while making the record, bands like Deathspell Omega and Aosoth. Dissection and Watain also inspired us with that melodic yet dark and aggressive sound. I consider myself a classic death metal junkie, so bands like Morbid Angel, Gorguts, Immolation, and Incantation are always very present. I remember listening a lot to The Chasm’s Farseeing the Paranormal Abysm and Inquisition’s Obscure Verses for the Multiverse, lots of Black Sabbath, Pentagram, Witchfinder General, and classic doom metal. Obscure, dissonant bands like Portal and Ulcerate were also big influences. However, I think what really gave Entheogen a distinctive sound were the non-metal influences: Godspeed You! Black Emperor, Sonic Youth, King Crimson, Swans, and Genesis, to name a few. You recorded the album back in 2014 with producer Juan Pablo Calvo at the helm. Tell us about the recording process and why you chose to go back to work with Juan? Juan Pablo is an amazing professional, a very talented musician, and a friend of the band. We knew he was able to understand our ideas and had the skills and resources to get the sound we wanted to achieve, so the band decided to work with him again. He also pushed us to transcend our limits as musicians to get the best out of us on the recording sessions, which went down very fluidly. We had a couple of sessions for each instrument and the vocals, then another one to work on the atmospheres, effects, and additional instruments. This recording process was a landmark for the band, a sort of checkpoint, I believe. It was a starting point for a new journey. What songs in particular off Entheogen do you get really excited about when you get to play them live? I think of this album as a whole entity. I really enjoy playing it in its entirety, but if I had to pick favorites, I’d say “The First Incarnation” because of its hypnotizing, introspective finale. It creates such an atmosphere, and is an essential song to play live. I also enjoy playing “Emerald Vision” particularly because of the intro and the high speed of the song. “Red Pulvis Solaris” is essential to play live as well; usually we finish the show with that one. Hard hitting, intense, and heavy, it sums up pretty well the whole experience of the album. You’ve had the release sitting ready for a while. It must have felt good to have struck a deal with Satanath Records [Russia] and to know that you’d be able to release the album soon, with both them and Germany’s RTM Productions at the helm, and to have North American distro secured with Sevared. Totally, it has been a long wait. It’s almost hard to believe that the release date is right around the corner, but we’re really looking forward to it. We are very thankful to Aleksey and Satanath Records for their trust, interest, and support. Reviews so far have been very positive and I believe this long wait has created some high expectations we hope will get fulfilled with the release of the album. We are very confident and satisfied with our work, so it’s a great feeling to know it will be available for the world to listen to very soon. Do you have any ideas for your next release? How is that coming along? There’s nothing concrete, but we have briefly discussed a few ideas. We want to get the most out of Entheogen and focus on it at the time so we’re not really trying to come up with something new right now. Now is the time to give this album all of our minds and energies to project it as it needs to be. Among what we have discussed, we would like to release an EP in-between albums to make an effective transition and avoid recycling ideas. When the whole process for this album is done, we will focus on the new material. For now though we’re focusing on getting Entheogen out there, and that’s the main goal for the rest of the year and probably the next one. We also want to tour Central, South and North America, and Europe next year. We’re working on getting the band and the album all the exposure they can get! Amazing bass work, really makes this material pop to my bassist ear. Some fine modern metal.